Last week I wrote a little bit about my impressions of Daredevil after the first few episodes. 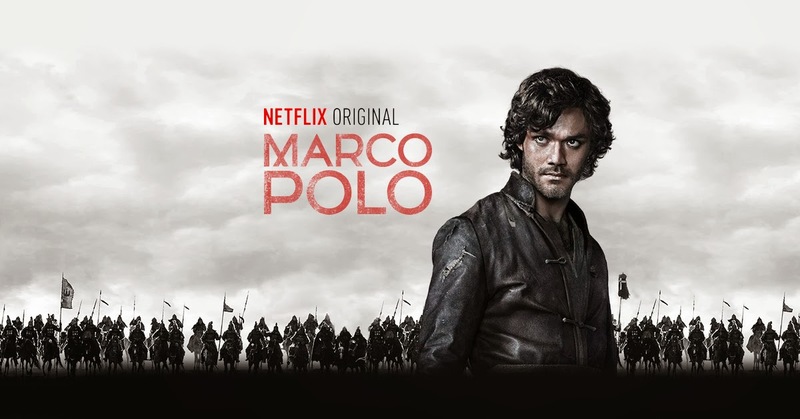 This week I checked out Marco Polo, another Netflix Original Series, and I'm reporting back after watching the same amount of episodes. I like it so much more than Daredevil. This is my kind of show. There's intrigue and competing objectives. It's epic in scope, yet based on real events of the past. In some ways it reminds me of Game of Thrones. Marco Polo is the son of a merchant who travels the world looking for new goods and trade routes. He tags along while his father is visiting Kublai Khan and ends up unexpectedly getting placed as a servant in his court to save his father's merchant dealings. It's the story of a westerner thrown into an eastern culture. It's all set in the 1200s and based on historic facts. I think that's so cool! I love the characters and I'm already very invested in seeing what ends up happening. This show immediately grabbed me in a way that Daredevil failed to. This is why I keep giving Netflix Original Series a try. Different shows appeal to different people and this one clicked with me. What's next? The Unbreakable Kimmie Schmidt? I wasn't aware of this one. I'll have to check it out! I'm not sure if that one is my kind of show. But Netflix originals are fantastic at the moment. I might just start trying out random ones.